Moro absorbed a lot of ki and turned both of them into a state where they can die any minute. Moro is surprised by the amount of ki he absorbed. His flesh was restored so much by just 2 mortals. Now, he’s a ripped demon goat and looks like someone in his 20-30s instead of someone in their 80-90s. Moro’s accomplice ‘Cranberry’ comes along and is flattering Moro but Moro warns him that he can see through his lies so it’s useless. After that, Moro and Cranberry start gathering the Dragon Balls destroying the villages on their way. Each Dragon Ball is in some different villages hidden away. Cranberry asks Moro about Goku and Vegeta but Moro is so sure that they will die any second now. Well, just as both of them were going to die, Esca and some other Namekian came and helped Goku & Vegeta. 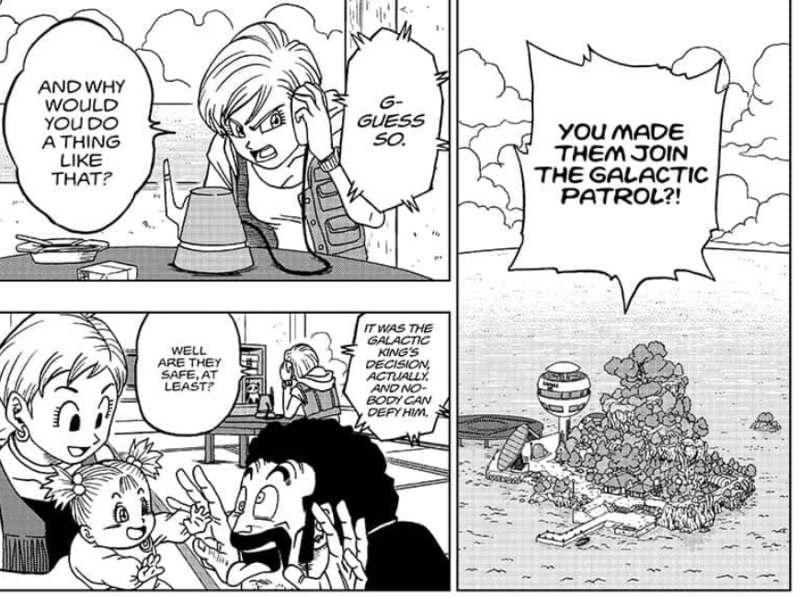 This Dragon Ball Super Chapter 46 English is getting pretty interesting. Then we see Bulma getting worried about Vegeta and Goku. She tries to contact Jaco and fights with him asking about Vegeta and Goku. Jaco cuts the call but just after that, he gets the news that Goku and Vegeta are alive even after facing Moro. In Dragon Ball Super Chapter 46, we also got to know that Majin Buu has finally woken up! Merus wants to meet him as soon as possible so he leaves everything and runs to the mess hall.